Hi, my name is Olga, and I work in Google's Computer Science Education department. I teach CS First classes and I'm a team leader with 4-H, America's largest youth organization where kids learn by doing. In this activity, you'll use code to-- Drum roll, please. Computer science uses code to give computers instructions, which is super cool because you can create anything you can imagine. Computer science is a subject you can study in school, and it's a also a career, or something you can do just for fun. You could use computer science to protect the environment, make music, launch rocket ships, save lives, and so much more. Today you'll use computer science concepts like sequencing, events, and loops to animate a name. To start, choose a word to animate. You could choose your name, a pet's name, an animal, a sport, a place, or anything you like. Your animation can express the emotion or personality of the word, tell a story, or just dance and be silly. After watching this video, click the Starter Project link. This will open Scratch in a new tab. Scratch uses code blocks to give character called sprites instructions like when a sprite is clicked, make it change color. After opening Scratch, return to this tab and choose videos to learn how to add and animate letters to make your project come to life. Watch as many videos and add as many letters as you like. And here's a helpful trick. While you work, pause a video and go to the Scratch tab to complete a step in your project. Or better yet, rearrange your windows to show Scratch and the video at the same time. Fiona, what did you make for your project? I animated the name of my 4-H club. Well, I animated the name of my home country Colombia. Open Scratch in a new tab. 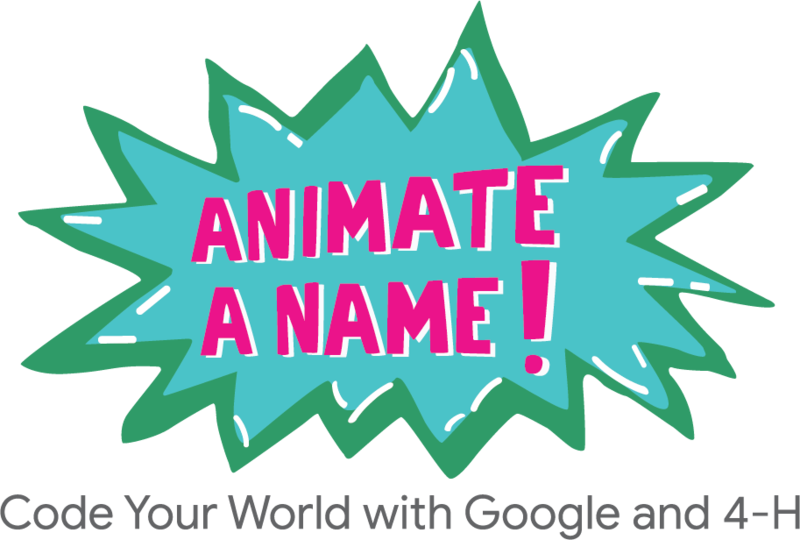 Title your project with the name you're going to animate. Return to this tab and select a video. Watch the video and complete the steps in your project. Then watch more videos to complete your animation. It's time to get coding!